Located 520km east of Darwin, the Maningrida community is wide and diverse. The region is home to 13 different community groups, is the major service centre for 42 outstations, and welcomes visitors and cultural tourists from far beyond the region. The local community is mostly indigenous and made up of approximately 3000 people. An overall precinct masterplan has been developed to guide the future development of the area, including a new welcome precinct. The Maningrida Arts Centre is the heart of the community and the cultural keeping place of art representing the region’s diverse groups. It is also a popular destination for cultural tourists and art purchasers. 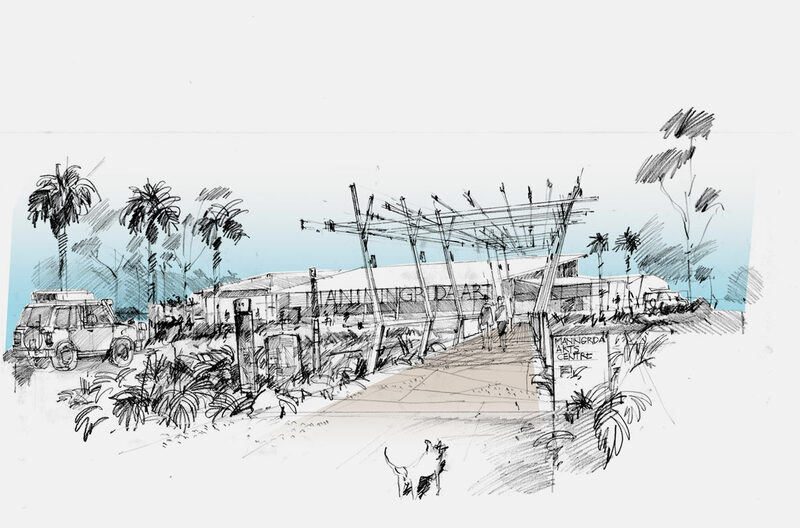 Hayball’s masterplan co-locates the Maningrida Arts Centre and a proposed new site for the Djomi Museum at the core of the Welcome Precinct to create a deeply meaningful civic place. The Welcome Precinct will be activated as a shared place for both visitors and community to meet and socialise, against a backdrop of civic buildings housing the heritage of the region.